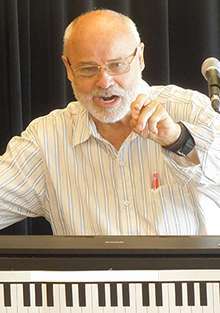 Vocal coach Seth Riggs at a 2013 vocal workshop. A vocal coach is sometimes responsible for writing and producing vocal arrangements for four-part harmony for backup vocalists or helping to develop counter melodies for a secondary vocalist. Some vocal coaches may also advise singers or bands on lyric-writing for a music production. Some critics allege that in some cases where popular music recordings credit a singer for work as a vocal coach during a recording, this may be a subtle way of acknowledging a ghostwriting role in which the coach pens lyrics for a singer-songwriter or rapper. In the 2000s, the increasing use of recording software which contains vocal processing algorithms and digital pitch correction devices is replacing some of the roles of the vocal coach. In the 1970s, if a producer wanted to record a single with a sports star with few vocal skills, the celebrity would need weeks of vocal coaching to learn their song and improve their tone and diction. In the 2000s, the vocals are often processed through time and pitch correction software instead in order to make their singing sound closer to that of a trained vocalist.